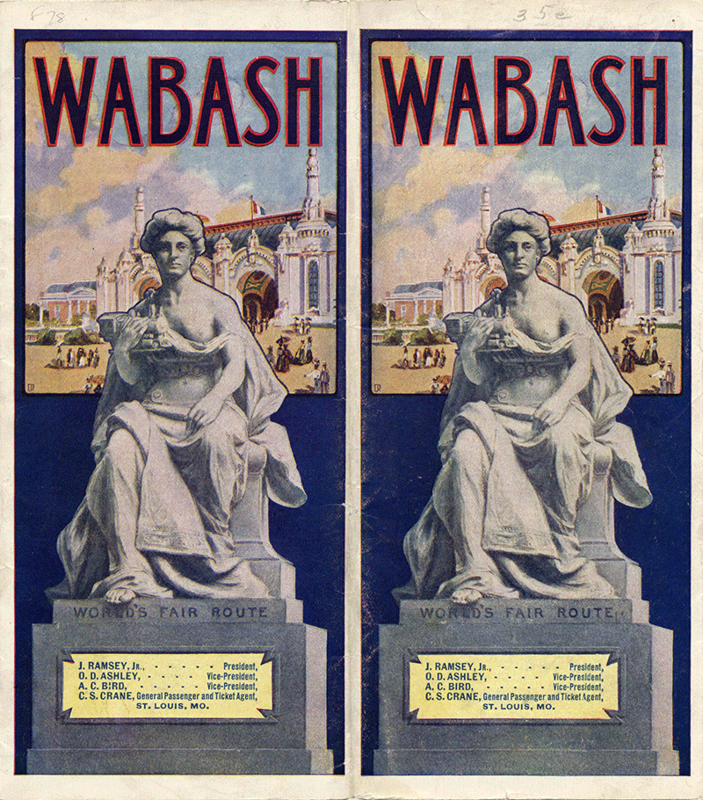 Many transportation companies worked hard to make getting to the Fair easy for visitors. Representatives from companies including the Wabash Railroad spent time in St. Louis working on equipment, scheduling and services. The Frisco System rail company provided drawing-room and observation sleeping cars along with cafe dining services to make the thirty-six hour trip from Galveston, Texas to St. Louis as enjoyable as possible. Similar accommodations and services were provided to riders from other parts of Texas, the Indian Territory, Arkansas, Kansas, and Missouri. 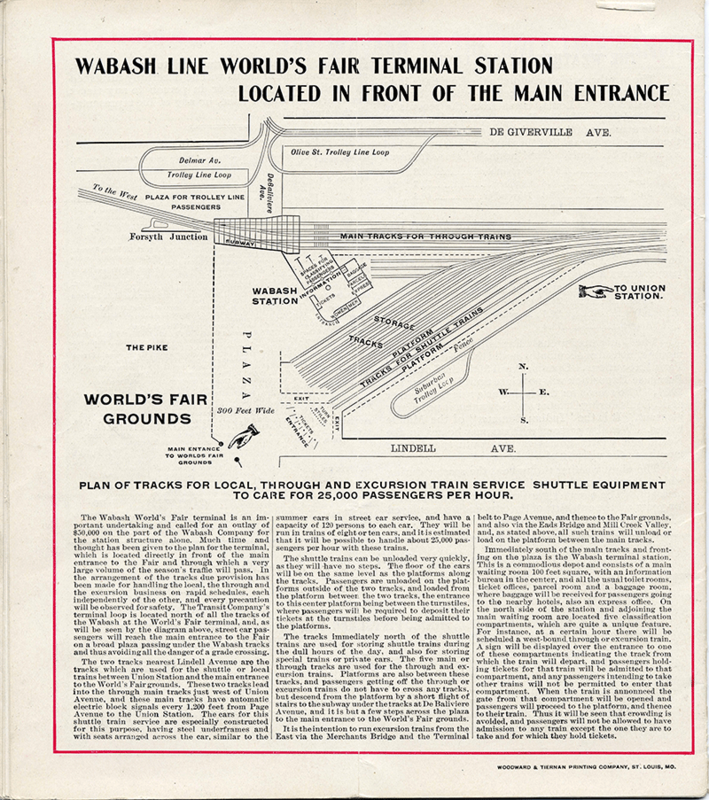 Many rail travelers arrived at Union Station and then used local cabs or streetcars to reach the Fair or their hotel. Some of these streetcars were really small trains with ten cars with each seating 100 people and running one minute apart. 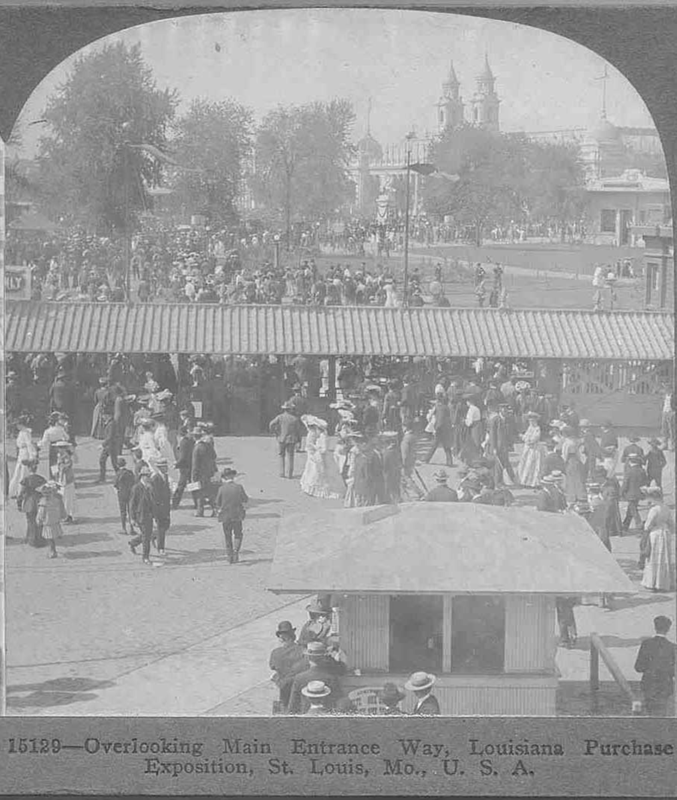 After reaching the Fairgrounds entrance, travelers deposited fifty cents in the new automatic turnstile. Then many jumped aboard the Intramural Railway, the electric streetcar that ran on nine miles of rail around the entire perimeter of the Fairgrounds. 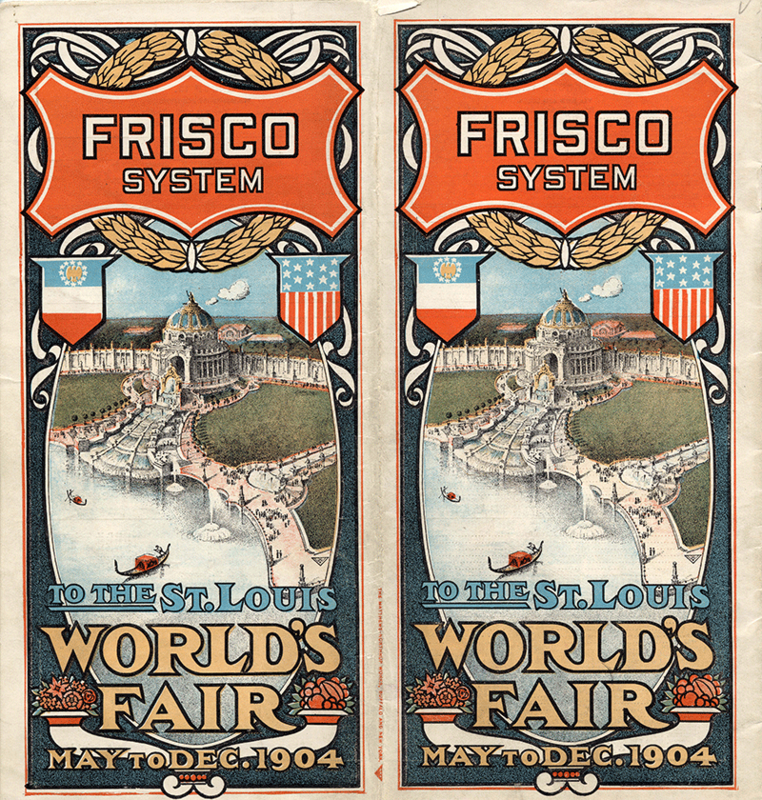 Once every week, usually Monday, children are admitted free to the World's Fair. 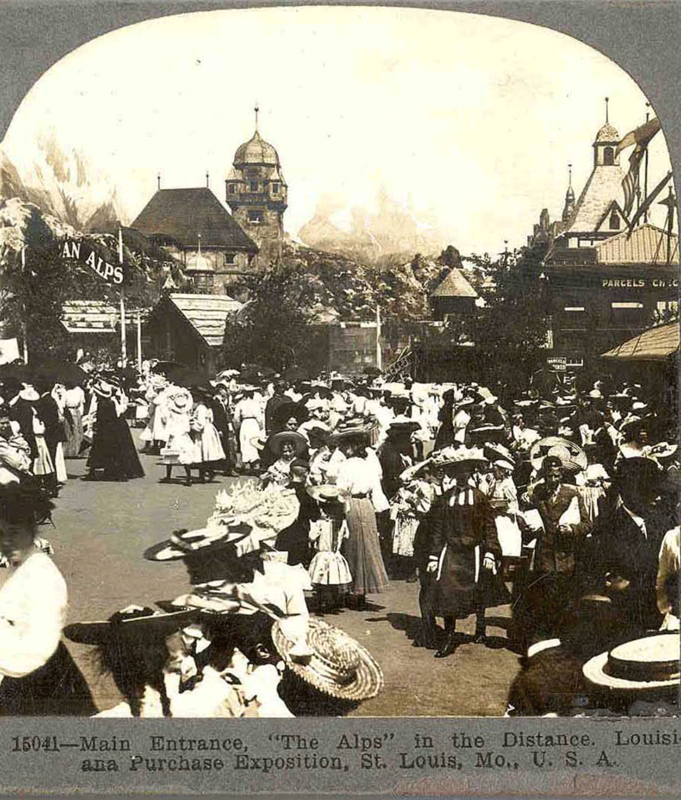 This view taken on such a day shows throngs of boys and girls scattering in every direction from the main entrance. As many as 35,000 attend the Fair on each free day. A part of the main entrance is shown on the right. In the background are the snowy peaks of the Tyrolean Alps rising behind the quaint buildings of the Tyrolese village. 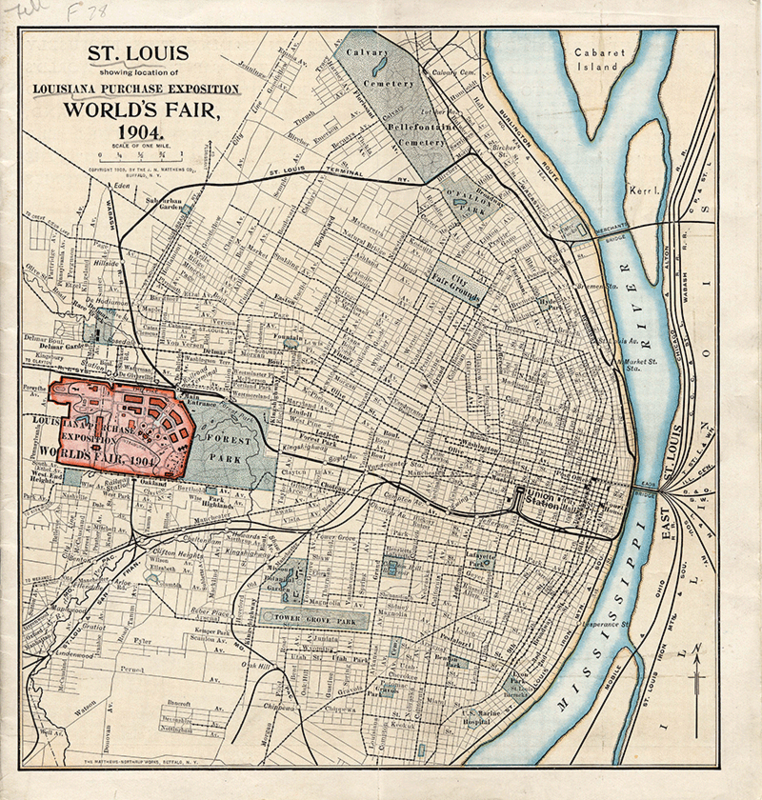 Through this entrance, known officially as the Lindell entrance because it is the terminus of St. Louis finest thoroughfare, Lindell boulevard, more visitors have passed daily into the World's Fair than through all the other nine combined. The low shed-like structure across the center of the view contains the turnstyles. There are thirty, fifteen on each side of a big central driveway for carriages. Those on one side are for passes and on the othr for paid admissions. The booth in the foreground is the office of one of the many money changers employed by the Exposition to supply half-dollars in exchange for money of other denominations. Their presence is necessary because admission tickets are not used. 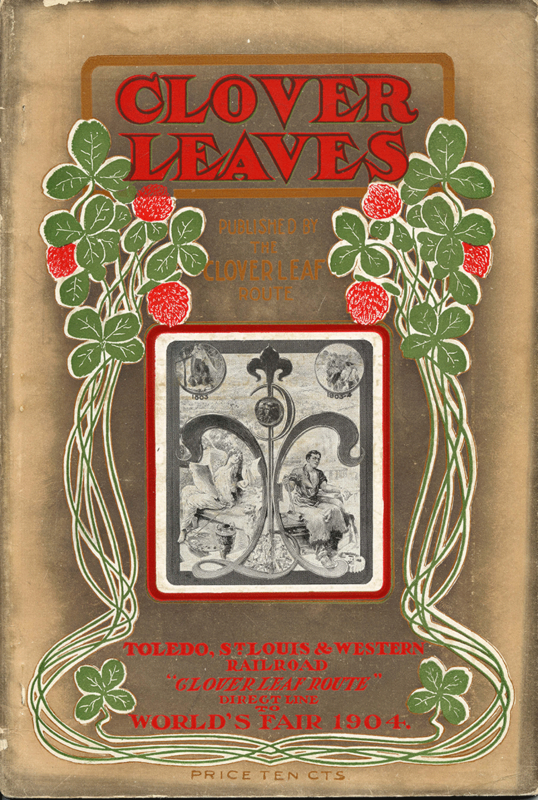 Clover Leaf route, direct line to World's Fair, 1904.